The Anniversary Day public holiday commemorates the day on 14th August 1816 when Great Britain took possession of Tristan da Cunha. 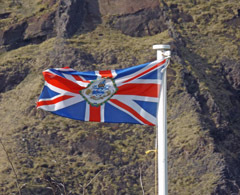 On 14th August 1816 a garrison aboard HMS Falmouth took possession of Tristan da Cunha on behalf of King George III: and from that day forward the island has been British. 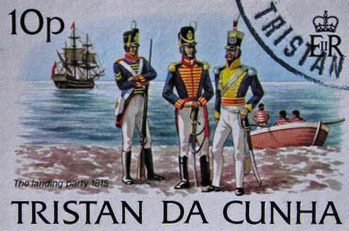 The Tristan da Cunha Post Office has marked the bicentenary by issuing a set of stamps depicting the Bicentenary of the British Garrison 1816 - 2016. The 35p stamp shown right shows Lieutenant Rice landing on the 14th August 1816, with Currie and Camilla waving the Union Flag as they approach - see Garrison Bi-Centenary Stamps for more. 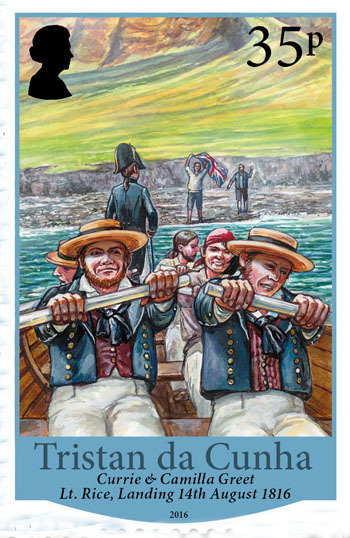 The Tristan Tourism Department has launched Tristan's first Geocaching Trail to mark the island's bicentenary of British rule on 14th August 2016 - see Garrison Geocaching Trail for more. 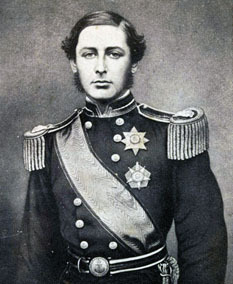 >HRH Prince Alfred was the second son of Queen Victoria and the first Duke of Edinburgh. He was in command of HMS Galatea on a world cruise which called at Tristan on 5th August 1867. The Settlement was later named 'Edinburgh of the Seven Seas' in honour of HRH's visit. 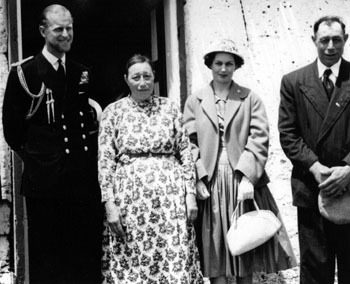 HRH Prince Philip, also Duke of Edinburgh, visited Tristan da Cunha aboard the Royal Yacht Britannia on 17th January 1957. He went ashore at the helm of the Tristan longboat Lorna and laid the foundation stone of the Prince Philip Hall which remains the community's social hub. The photo shows HRH with Chief Willie Repetto, 'Aunty' Martha Rogers and in between Joy Forsyth-Thompson, wife of the resident Administrator. 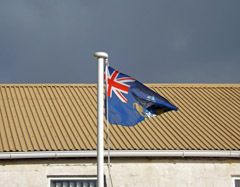 I am delighted to have this opportunity to send my best wishes to everyone on Tristan da Cunha for the celebrations marking 200 years of the British settlement on the island. I have many vivid memories of my visit to the island in the Royal Yacht Britannia in 1957, and I have followed activities on the island ever since. I hope that nothing untoward will interfere with the celebrations and that everyone will have a wonderful time marking this very important anniversary, and I wish the whole Tristan community a very happy future. Official Crown Copyright photograph of HM The Queen with HRH The Duke of Edinburgh at the Service of Thanksgiving in St Paul's Cathedral on 10th June 2016, which was also Prince Philip's 95th birthday. HRH Prince Philip was guest of honour at the dinner to celebrate the 500th anniversary of the discovery of Tristan da Cunha held at the Royal Geographical Society on 3rd November 2006. The Tristan Association sends HRH the Tristan Newsletter and we are aware how follows island matters with great interest. 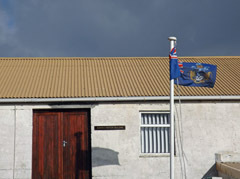 Members of the Tristan da Cunha Association join in sending heartiest congratulations to all Tristan islanders for successfully achieving two hundred years of exemplary community life on the world’s most isolated inhabited island. We send very best wishes for your future together there, while you care also for the natural environment and its unique wildlife, and you continue to welcome visitors warmly too. but marked always by a Public Holiday and by the flying of flags. Thursday 14th August 2014 was again a low-key commemoration with families taking the Public Holiday break from work to spend time with each other and catch up with jobs or do a spot of fishing. In two years time Tristan will celebrate 200 years as a British Possession, formerly a British Empire Colony and now a UK Overseas Territory. Anniversary Day 2013: On Wednesday 14th August 2013 the island community celebrated the annual Anniversary Day Public Holiday with family and friends, perhaps with some beach fishing or catching up with farming or household jobs. 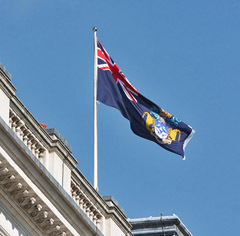 The photo right from Tristan Desk Officer Ian Cramman shows the Tristan flag flying proudly above the Foreign and Commonwealth Office in Whitehall in London for the first timeon Anniversary Day. 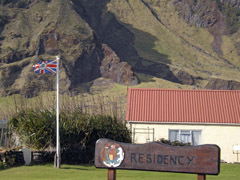 Photos left and below taken by Dawn Repetto on 14th August 2013 show left and below right the Tristan Administrator's flag flown at The Residency and below centre and left the Tristan da Cunha flag flying at the island's Administration Building, often called 'Whitehall'!